OUR LUCKY WINNER IS: Kassandra V.
The YA series RL Stine can't put down! Thoughtfully imaginative, action-packed, and set in a 19th-century South African fantasy world, Steeplejack by New York Times-bestselling A.J. Hartley was met with resounding critical acclaim from authors, reviewers, and readers alike. Steeplejack introduced the world to Anglet Sutonga, and brave and smart young woman navigating the complicated world of Bar-Selehm. In Firebrand, Ang goes undercover at an elite club in order to unmask a thief selling government secrets, but stumbles upon a greater plot that endangers the most vulnerable in Bar-Selehm. Once a steeplejack, Ang is used to scaling the heights of Bar-Selehm. Nowadays she assists politician Josiah Willinghouse behind the scenes of Parliament. The latest threat to the city-state: government plans for a secret weapon are stolen and feared to be sold to the rival nation of Grappoli. The investigation leads right to the doorsteps of Elitus, one of the most exclusive social clubs in the city. In order to catch the thief, Ang must pretend to be a foreign princess and infiltrate Elitus. But Ang is far from royal material, so Willinghouse enlists help from the exacting Madam Nahreem to train Ang in the ways of Bar-Selehm’s upper class. Meanwhile, refugees are trickling into the city, fleeing Grappoli-fueled conflicts in the north. A demagogue in Parliament is proposing extreme measures to get rid of them, and Ang soon discovers that one theft could spark a conflagration of conspiracy that threatens the most vulnerable of Bar-Selehm. Unless she can stop it. 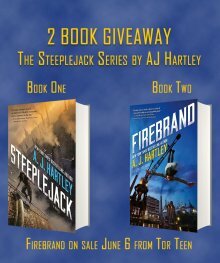 Enter to win copies of Firebrand and Steplejack!